With the AVIS a valid test for the self-evaluation of aggressive behavior in road traffic is available. What is special about this test is that normal situations and stressful ones are compared. The present test results from a theoretically grounded deduction of dimensions relevant to aggression, secured in a factor analytical way. It contains 65 items, presented in the first run with a standard instruction. Both the extent and the frequency of aggressive ways of behavior in road traffic are recorded. In a second run those same 65 items are presented under conditions of stress. The difference between the first and the second run serves as an indicator to record the tendency to give socially desirable answers. After the instruction the items of the first run are presented one after the other. The respondent chooses his / her answer out of eight answer categories from Very rarely to Very frequently. A one-time correction and the skipping of items are permitted. All unanswered items are presented again at the end of the run, but there is no obligation to answer. Then the instruction for the second run is presented on the screen and followed by the items from the previous run embedded, however, in conditions of stress. The variables "instrumental aggression", "aggravation", "acting out", "enjoyment of violence", "negativism", "social conformity", as well as a "total" of the scales without social acceptance are recorded. Additionally the differences between normal and stressful conditions of the corresponding scales are recorded. The inner consistency of the test was calculated as Cronbach's Alpha. For the normal conditions the inner consistency (mean value of all scales) is r=0.96, for the stressful conditions it is r=0.97. There are many studies of the construct and criterion validity of AVIS; for a summary see Herzberg (2001a). 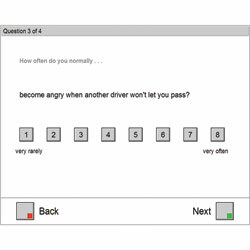 Construct validation is based on the analysis of inter-individual differences in the test results, studies of the convergent and discriminant validity of AVIS and common factor analyses with tests that have related and divergent validity - these include psychometric personality tests, interpretative tests, driving-related tests and observer ratings. The construct validity of AVIS has been proven. The criteria used were the number of warnings and fines, the current total of points registered with the Central Index of Traffic Offences in Flensburg and the number of points registered in the last three years, the total number of accidents, the number of accidents in which the subject had been at fault and the number of times the driving licence had been revoked. Because of the distribution characteristics of the criteria and the associated problems of reliability (Klebelsberg, 1982), the analysis of the correlations between the AVIS scales and the criteria was carried out using structural equation models. Significant statistical correlations between AVIS and all the criteria were found. Norms are currently available only for the standard form S1. For all the variables overall norms from a sample of N=342 individuals are available, as well as age-specific and education-specific norms. For the short form S2 only the norms of the standard form are available at present. Work on the production of separate norms for the short form S2 is currently in progress. Between 8-25 minutes (including instruction and practice phase), depending on test form.